Wear the LUSH Cedella Light Wash Denim Wide-Leg Overalls on a seaside excursion or a spur of the moment road trip! 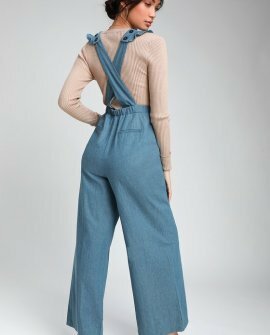 These sweet little overalls have a retro-inspired look thanks to a lightweight denim construction and flirty ruffled detail at the shoulders. Wide straps (with two button adjustments) crisscross at back and carry into a plunging bodice, banded, high-waist (with elastic at back), and a cute button front. Wide-leg pants feature diagonal side seam pockets.